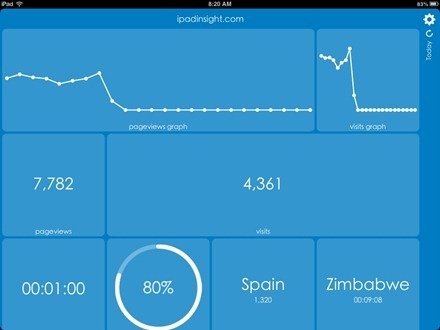 Analytics Tiles App is an iPad and iOS app that presents your Google Analytics (GA) website data in a new and unique way. As the name might imply, the app offers up your data in a set of colorful tiles that you can manipulate. It uses one tile for each GA report area – e.g. page views, visits, average time on site, top referral, top keywords, and so on. There’s generous spacing between the tiles, so it’s easy to take in the information as you browse through them. You just tap, hold, and drag to re-order the tiles any way you like. With a swipe up you can add or remove tiles, an with another swipe up you can modify the color scheme. I keep tabs on a handful of sites I own or am involved with – it’s great being able to color-code them and easily distinguish one from another at a quick glance. Tiles is all about making the right decisions fast! Put stats that matter to you up front and don’t waste time digging through endless content. Just add, move and remove the stats that you need. If you’re monitoring a shop, put the transaction and e-commerce metrics on top, if you are into goals, put your conversions on top. It’s kind of like a grid and you’re in control of what comes where. The app is touted as simple, powerful and ‘insanely fun to use’. And I’m happy to see it absolutely lives up to that claim. I’ve used a number of tracking and analytics apps on the iPad and Analytics Tiles is by far and away the most pleasing to use. It’s not just fun to use though – I think it actually ends up being a more affective analytics app too, because it’s so easy to spend a lot of time in it and take in a lot of stats and trends. When I first launched the app I was immediately impressed and thought it looked awfully promising. I’ve been using it for weeks now and my appreciation of it has only grown. It has a permanent place on my first home screen and is already a firm favorite. 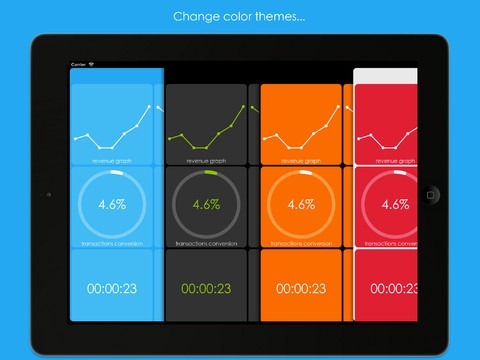 Here’s an App Store link for Analytics Tiles App; it’s priced at $2.99. Disclosure: This app was independently purchased by the post author. For information about our review policies please see our About page.